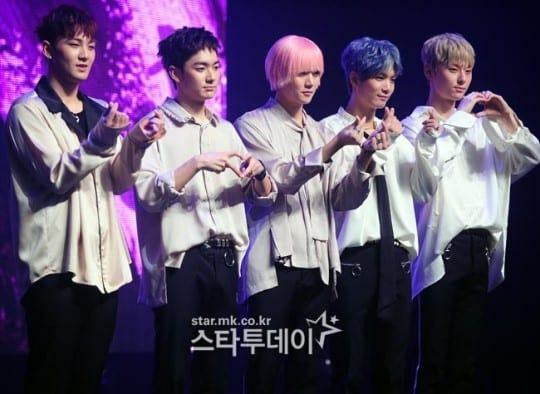 Fans opposed the 2.5th fan club recruitment of boy group NU’EST. On Feb 11th, NU’EST announced on their official Twitter account that the recruitment for the 2.5th generation of NU’EST fan club L.O.Λ.E was opened. While Hwang Minhyun was active as a part of Mnet’s project group WANNA ONE, NU’EST continued with a unit without Hwang Minhyun which was called NU’EST W. During that time, the agency Pledis had already opened the 2nd recruitment for L.O.Λ.E. It is said that after Hwang Minhyun finished his WANNA ONE activities and returned to NU’EST, Pledis decided to open the 2.5th recruitment for fans of Hwang Minhyun and new NU’EST fans. However, the benefits and notes of the 2.5th L.O.Λ.E have drawn fans’ opposition. The benefits of 2.5th L.O.Λ.Es at concerts and fan meetings are after the 2nd generation L.O.Λ.Es. Fans are angry and think that the agency is trying to cause division inside the NU’EST’s fandom. NU’EST debuted in 2012 and While Hwang Minhyun was active as a part of Mnet’s project group WANNA ONE, NU’EST continued with a unit without Hwang Minhyun which was called NU’EST W. Last month, NU’EST’s agency Pledis, announced that the boygroup is making a comeback soon with all 5 members. The official profile of ITZY’s member is out, the leader position is quite unexpected!